He was born in Margao, Goa. He was born in Brahmin Hindu family, strict followers of traditional values. 1946 Offered Satyagraha, Madgaon, toured in police custody. Participated in Goa Liberation Movement. After completing his academic studies in J.J. School of Art Laxman Pai left to continue work in Paris. In Europe he gained technical experience in printmaking and oil painting. 1951 Goes to Paris, where he stayed for ten years. Primary education in Madgaon, first in Marathi for four years from Damodar Vidyalaya, then two years in Portuguese and further in English from New Era High School, to complete Bombay University Matriculation. 1943-47 Educated at the J.J. School, Bombay. 1949 Joint exhb. with S. Palsikar, Bombay Art Society, Bombay. 1950 First solo exhb., opened by Mr. Karl J. Khandalwala, Bombay Art Society, Bombay. 1951 Exhb., Salon d` Automne, Paris. 1952 Exhb., Rue de Sein, Paris. 1952 Exhb., Galerie Raymond Duncan, Paris. 1952 Solo exhb., Galerie Beaux- Arts, London. 1953 Exhb., Rue St. Placide, Paris. 1953 Solo exhb., Galerie W. Gurlitt, Munich. 1953 Solo exhb., AIFACS, New Delhi. 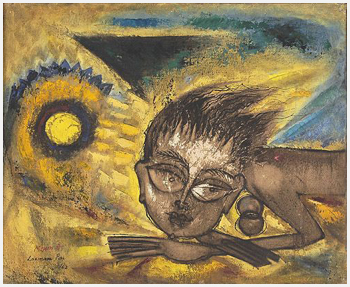 1954 Exhb., Alliance Francaise, Bombay. 1954 Solo exhb., Galerie R. Duncan, Paris. 1955 Solo exhb., Galerie Marcel Bernheim, Paris. 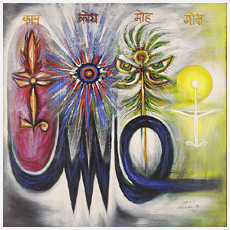 1955 Retrospective (1945-55), under the patronage of Congress for Cultural, paintings on `Geet Govinda`, Sanskrit poem of XII century, Paris. 1956 `Images de Goa`, Galerie Prismes, Rue Monsieur Le Prince, Paris. 1957 Exhb., Galerie Gurlitt, Munich. 1957 Exhb., Palais Dauphine, Paris. 1958 `Ramayana and Life of Mahatma Gandhi`, Galerie de l` Alliance, Bombay and New Delhi. Ben & Abbey Grey Foundation, USA. New York Public Library. Berlin Museum, Germany. Museum of Modern Art, Paris. Madras Museum. Nagpur Museum. New York Library. National Gallery of Modern Art, New Delhi. Punjab University Museum. 1947 Received Mayo Medal. 1961,63 National Award, Lalit Kala Akademi. 1972 National Award, Kangra Portraits Show, New Delhi. 1985 Awarded Padma Shri, Govt. of India. 1987 Honored by Govt. of Goa. 1995 Nehru Award, Goa. 1947-51 Taught at J.J. School of Art, Bombay. 1977-87 Principal, Goa College of Art, Goa.